According to a study in October 2016 by mom.life 80% of moms report being mom-shamed. 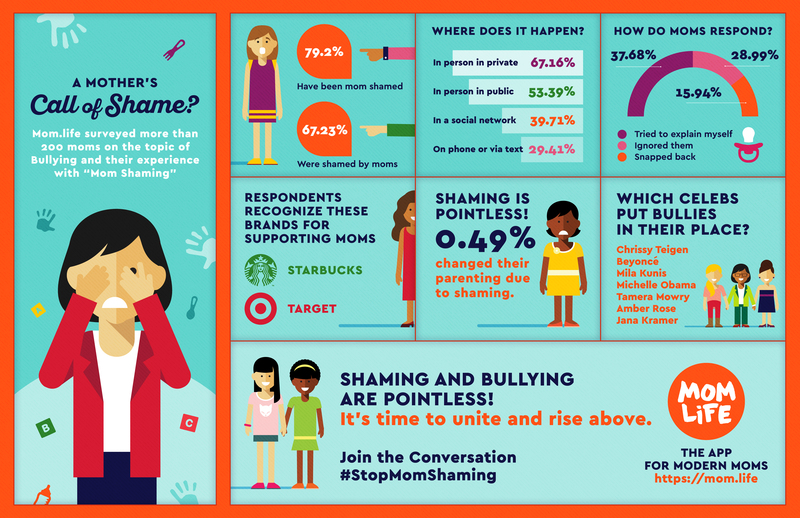 67% were shamed by other moms. 64% were shamed for their feeding choices. However less than .5% report changing any behavior due to the shaming. Therefore there is nothing good coming from this. What are thing moms report being shamed for? Breastfeeding, formula feeding, medicated birth, C-section, adopting, going back to work, staying at home, using a babysitter, cosleeping, not room sharing, being a single mom, traveling to soon, choice of foods, screen time, being a helicopter parent, being a free range parent, not being involved in the school, not having a set schedule, etc This list goes on & on & on. Personally, I will never forget the first time I was publically mom-shamed. It was a backhanded comment in a bathroom at an airport by a stranger. She commented on how she liked my son’s carrier & how wonderful I was to be wearing him close. She then asked if I was breastfeeding him. When I responded no, she said “I just figured since you love him enough to wear him, you’d love him enough to breastfeed” That comment will sit with me for a long long time. What a horrible woman to infer that I didn’t love my son because I don’t breastfeed? And those moms who don’t babywear don’t love their children as much as those who do? And why would she ever think that was something acceptable to say? She was long gone before I picked my jaw up off the floor and left that bathroom, shocked by her comments. Had she asked why, or wanted to be informed, I would have gladly have shared my story of why I formula fed from birth however, like many others she decided to shame instead of open her mind. What happened to the old fashioned saying “If you don’t have something nice to say, don’t say anything at all”? I think lots of people need to go back and watch Bambi a few times to get a dose of good advice. Mothers should be here to support and love each other, not tear each other down. So please, stand up for other moms when you see this happening & help to stop the shaming.